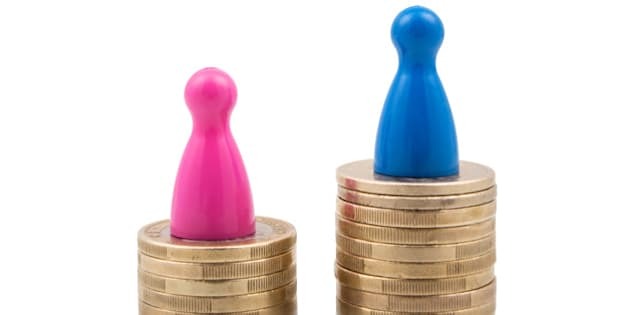 While "equal pay for work of equal value" is enshrined in law under Ontario's Pay Equity Act, the gender wage gap is a serious issue. Statistics Canada data estimates the gap to be anywhere between 12 to 31.5 per cent and RBC estimates it is costing the Canadian economy $168 billion in lost income. Pink and blue figures on different coin stacks. Concept for gender pay gap. Government and business should do more to address the gender wage gap including expanding government training on pay equity issues/solutions and exposing young women to female role models from the STEM sectors according to Closing the Gender Wage Gap: A Review and Recommendations by the Human Resources Professionals Association (HRPA). Submitted to the Ontario Ministry of Labour as part of its recent gender wage gap consultations, the HRPA report looks at factors (often the result of unconscious biases) associated with the gender wage gap at various stages of a woman's life, from childhood education to the workplace. They include education and choosing a career path; negotiating; getting hired; wage transparency; performance evaluations; and workplace flexibility. For example, as high school students, many young women may avoid working towards higher paid (and male dominated) careers in the science, technology, engineering and mathematics (STEM) fields because of a "stereotype threat" in math and science -- something that follows women who do choose STEM careers, with studies showing male faculty can have an unconscious bias that men are more competent and hireable than women. In the workplace, one study examined in the report looked at gender differences when evaluating job applications and found interviewers rating male applicants higher even though the women had identical qualifications -- especially in male-dominated occupations. And regarding workplace flexibility and balancing work and child or elder care (which is still primarily done by women), other research has shown that women with children may be penalized compared to those without. Biases may cause mothers to be seen as less competent, and offered lower starting salaries. To encourage more young women to enter the STEM and skilled trade sectors, the report recommends the Ontario government and HRPA partner to develop a pilot educational campaign featuring female STEM professional role models targeted at senior elementary school women, with the goal of educating them about career opportunities while combating stereotypes. To improve women's negotiation skills, the report recommends government-sponsored negotiation training aimed at both high school students and women in higher education and professionals. To increase managerial knowledge about the issue and solutions, the report recommends government expand its training on pay equity issues and solutions--similar to the mandatory Supervisor Awareness Training the Ministry of Labour requires for the Occupational Health and Safety Act. To increase wage transparency, the report advises government introducing wage transparency rules and business standardizing salaries -- particularly for starting salaries. And to avoid biases during the hiring process, the report recommends businesses implement gender blind initial reviews -- asking raters to evaluate an applicant's qualifications prior to knowing their gender. According to the report, HR professionals can play an important role in helping to reduce the gender wage gap because they are uniquely positioned to identify the influence of potential stereotypes and biases in others, and also educate managers and supervisors about the issue and effective solutions. As regulated HR professionals, HRPA-designated Certified Human Resources Professionals, Certified Human Resources Leaders and Certified Human Resources Executives have a duty to protect the public and work to correct the gender wage gap by staying current on pay equity techniques and approaches and helping their organizations implement effective solutions. By working together to help close the gender wage gap, government, business and HR professionals can correct an imbalance that's not only costing the Canadian economy but is inherently unfair for half of the population. Duff McCutcheon is communications specialist with the Human Resources Professionals Association (HRPA).